Results: Dean Ambrose and the Hardys defeated Sheamus, Cesaro, and The Miz; Elia Samson defeated Zac “Jobber” Evans; Samoa Joe defeated Finn Balor and Bray Wyatt (Triple Threat Match); Rich Swann defeated Noam Dar; Titus O’Neil defeated Kalisto; Austin Aries and Jack Gallagher defeated Neville and T.J. Perkins; Roman Reigns defeated Seth Rollins. Monday Night Raw still isn’t the best at crafting great go-home shows when you look at it in terms of really selling the matches for the upcoming PPV, but this week’s show is a hell of a lot better than some of the ones we’ve seen in the last few months. There are intriguing narrative threads left dangling, creating some mystery for Sunday and beyond, and there’s a ton of great wrestling to boot. A solid show all around, broken down a little bit more below. Thankfully, Raw kicks of with Cesaro and Sheamus not wrestling the Hardys…at least for a bit. Instead we get a Miz TV segment punctuated by an appearance from Ambrose, his “backup” the Hardys, and the subsequent six-man tag team match that follows any and all interactions between multiple superstars in WWE. The match is fine, but it does once again reveal that the Hardys don’t seem to have much in the tank in terms of their in-ring work. Their moves don’t have that crispness to them, and it’s resulting in sloppy looking matches. Not only is Goldust back with his classic film-referencing segments, but R-Truth is playing his game and musing on the virtues of Shaft and Jules Winnfield. I am very ready for those two to tear each other apart at Extreme Rules. I really hope they get the time to put something good together. I love that Samoa Joe actually has an explanation for watching some Finn Balor footage—stuff like that is always ignored—which is that he’s learning about the best places to hurt him. Samoa Joe has been sneakily good on the main roster so far. Maybe no single storyline has stood out, but he’s been a good piece whose viciousness isn’t going unnoticed. The Triple Threat match between Samoa Joe, Bray Wyatt, and Finn Balor, booked last week by Kurt Angle, earns the co-main event title. It has all the Triple Threat spots you would expect with this group, with Wyatt and Joe temporarily teaming up before turning on each other, and also has Balor looking the best he’s been since returning from injury. The “babyface in peril” structure really worked for him here, where he’s pitted against two big, deadly dudes. 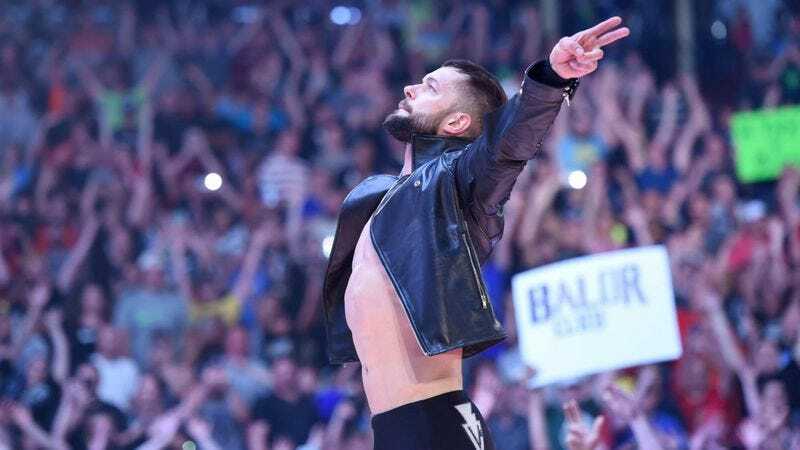 His work felt more energized and hard-hitting, which is key to getting Balor over. So, the feud between Alicia Fox, Sasha Banks, Noam Dar, and Rich Swann hasn’t exactly been hitting it’s mark. When it hasn’t been dull it’s been offensive and reductive. That said, this week’s show sees Swann and Banks bust out a choreographed dance routine at the end of the match, so everything’s pure and good now. Here’s hoping their mixed tag team match on Sunday is a solid payoff. One of the night’s more intriguing elements is the “who attacked Enzo?” mystery that kicked off last week. Here, Graves suddenly disappears when he sees something on his phone and goes to show it to Kurt Angle. Angle then laments that it could “ruin him.” (Admittedly, I don’t know that this is connected to the Enzo story, but that seems to be the suggestion). Then, when Graves is back on the commentary table he tosses off a comment about Cass maybe being the one who attacked Enzo, and that brings Cass out to get in his face. On top of all that, Enzo is attacked again, and Angle asserts that The Revival, previously thought to be the culprits based on some suspicious backstage video, had already left the building. The plot thickens! More than anything, it’s just good to see some storytelling within the tag team division that isn’t the repetitive nonsense we’ve been getting with the likes of the Hardys, Cesaro and Sheamus, and the Club before that. I guess I can’t avoid it any longer, so here’s some thoughts on Alexa Bliss Presents “Bayley: This Is Your Life”: it’s horrible. It’s a drawn out, unfunny slog that doesn’t do anything for anybody. Alexa Bliss is great on the mic, and yet this is what WWE gives her to work with. Credit to Bliss, who tries to turn things around here and there, but there’s just no hope. It’s such a misguided segment because it doesn’t capture what makes Alexa Bliss special or embody who the character is. Bliss is confident and entitled, not petty, and this segment doesn’t do that character justice. Thankfully, Raw followed that up with a Cruiserweight tag match we saw two weeks ago, with guys that we’ve seen wrestle each other nearly every week since Wrestlemania. That’s definitely how you keep a crowd engaged. Now, if you want your crowd to be engaged, you throw Roman Reigns and Seth Rollins into a match and watch their chemistry work. These two don’t know how to put on a bad match together. It’s not just their history either, though that certainly can’t be ignored. It’s the fact that they both show flashes of brilliance in their other work, but really bring that out with each other. Both Reigns and Rollins are experts when it comes to pacing a WWE style match, and they milk the build in tension, with all the false finishes and trading of signature moves—and a killer Buckle Bomb into a Superman Punch—for all it’s worth here. Sure, it’s a mostly meaningless match in the grand scheme of things, but it’s exactly what you want out of a Monday night main event.